Have I mentioned how much I love being married to a construction manager? I can be pretty crafty with a sewing machine and a glue gun. My husband can be pretty amazing with a nail gun and power tools. Together I think we make the perfect DIY match made in heaven! Last Saturday we decided to start on a fence to separate the garden from the rest of the yard. We really need to keep the chickens out of the garden before the girls eat all of our hard work! 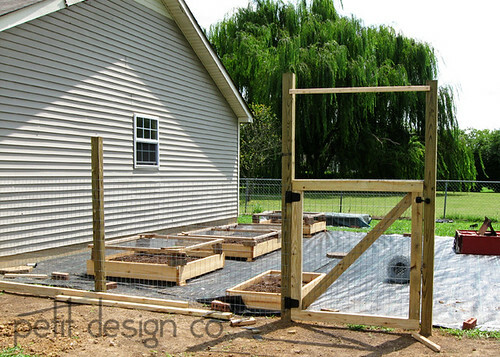 I showed my husband several fence ideas I had pinned to my garden pinterest board. While I really loved the rustic look of the pallet fences, my husband convinced me otherwise. While the pallets could be found for free, it would have been hard to find enough matching ones for the length we needed. It would also mean that we would have to dig twice as many holes for twice as many posts to make a fence like this one here. 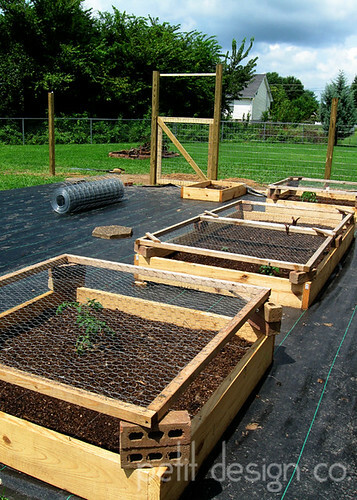 To top it off we would also have to buy some sort of netting to add to the back for keeping our chickens out. 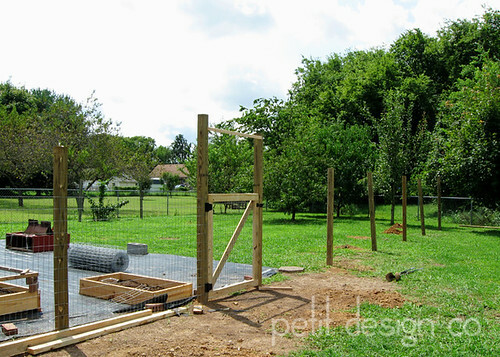 Overall it really would have been more work and just as expensive as making a welded wire fence. There really isn’t much difference except more holes and more posts set. Overall we have to put in about 75’ of fencing all the way down to the chain link fence. All of these pictures were taken on the same day and you can see the storm brewing in the bottom picture. The skies are clear in one direction and stroming in the other. Gotta love the crazy southern weather! I needed to keep the girls from eating all of the sprouts in the garden. We already had these screens lying around (they were our temporary chicken run) so I propped them up on bricks over the garden. They worked to keep the chickens from digging in the garden but it only took them a few days to figure out they could still reach the sprouts right by the edges of the grow box. Little stinkers! Yesterday evening my husband and I worked until we finished the fence while the kids watched the baby for us. I wasn’t going to loose another seedling to the chickens! I’ll share more garden pictures later in the week since it pretty much looks the same. Our chickies have been dining on grapes and tomatoes while we have been so busy in the past week. Congrats getting the fence finished to save your garden. It's fun seeing your garden progress. Thanks for sharing.